Here is a real baby photographed inside the mother’s womb. In 1957 Dr. Lennart Nilsson began taking pictures with an endoscope, a slender instrument that can send light into a body cavity and send a picture back to the doctor who is making the investigation. 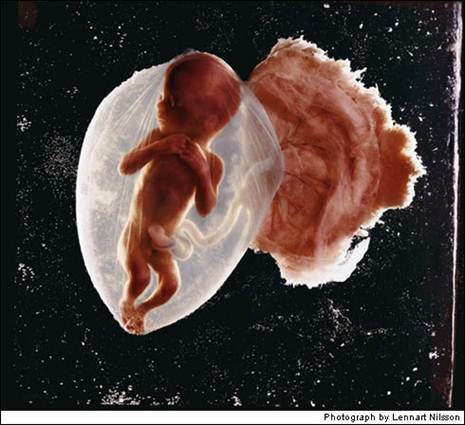 In 1965 Dr. Nilsson created a fascinating photo essay for Life magazine, and above you see just one of the pictures in that story showing how life begins in the mother’s womb. “How Life Begins”. Lennart Nilsson. © LIFE Magazine, 1965. Accessed 8 July 2010. “How Life Begins” LIFE Magazine. Accessed 11 July 2010.